The dry handling test is the most comprehensive test for the tyres’ overall dry performance. 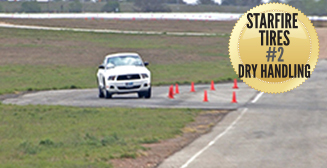 The test covers all aspects of everyday driving from long high speed straights, tight off-camber turns and rapid direction changes, whilst trying to complete the course in the fastest possible time. Rapid direction changes can occur when lane changing. The testing video highlights the importance of tyres that have good dry handling performance during lane changing. As you can see in the results, the Starfire Tire performs extremely well in dry conditions. Giving you and your family a quality tyre that provides year round safety, without paying a premium price. The tyre has been pushed to the limits so you do not need to.